Dravid, who fractured his cheekbone after getting hit by a Shahadat Hossain bouncer in Mirpur, was advised three weeks' rest, the release said. It also said that Yuvraj was out for the whole series. Kris Srikkanth, the chairman of selectors, though, said they would reassess the injury status after the first Test. 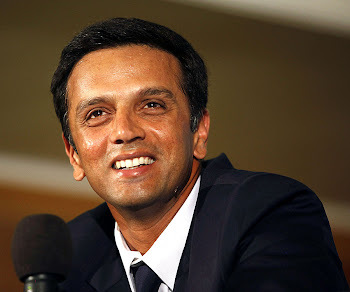 "Dravid was very keen to play but the doctors have advised him rest as a precautionary measure," Srikkanth said. "We have selected the best possible team considering the number of injuries that the Indian team have suffered in the recent series. "The team has been selected just for the first Test. We will take a call on the team for the second Test after getting the fitness report of the injured players." It’s not official, but the national selectors appear to have got an indication that both Rahul Dravid and V.V.S. Laxman would be available for the two-Test series against South Africa. “There’s been no formal communication from the Board, but it seems the selectors have been given to understand that both Dravid and Laxman are going to be available... They’ve probably begun planning keeping that in mind,” a well-placed source told The Telegraph. Rahul has been discharged from the hospital. He will be returning home for further treatment. Rahul Dravid, admitted to Dhaka’s Square Hospital after being felled by a Shahadat Hossain bouncer, on Monday afternoon, was “much better” when The Telegraph contacted the doctor on duty there at 10.45 pm.“Dravid’s much better... In fact, he’s sleeping right now... He had soup in the evening and, a short while ago, biscuits in milk... He has also been given daab water,” the doctor, who requested not to be identified, said. The doctor added: “Dravid’s not in pain, but that’s because he’s on pain-killers... He’ll remain on a liquid diet till assessed by the orthopaedic surgeon (Dr Fazlul Huq) under whom he’s been admitted... Surgery isn’t planned...”. Dravid’s in a “VIP room” on the 12th floor and not in the ICU, as mentioned in some reports coming out of the Bangladesh capital. Among the technically most accomplished of all time, Dravid still got deceived by the dual bounce and ended up ducking into the bouncer in over No.2 of the second new ball.The blow fractured his left jaw bone.Fortunately, thanks to the helmet, Dravid didn’t suffer a more serious injury. The ball, being new, was hard and anything may have happened to the former captain. Dravid was then on 111 (29th Test hundred) and his availability for the home series against South Africa, beginning on February 6, is now in question.It would be a huge setback if he’s not available.The Bangladesh quicks, incidentally, had been unusually aggressive during the day. That, too, on a wicket with “unpredictable bounce”, as the other centurion, Sachin Tendulkar, put it. It’s not official, but Dravid won’t be playing any further role in the ongoing Test, at the Sher-e-Bangla National Cricket Stadium. Dravid has been kept in the Intensive Care Unit (ICU) of the Square Hospital in Dhaka under observation as a precautionary measure. "He is comparatively better than before," Fazlul Haq, the attending doctor in the hospital, told Cricinfo. "He will be here for a night and he is likely to be discharged tomorrow." Asked whether it was a fracture, Haq said: "It's not exactly a fracture, more a sort of severe sprain. We are just keeping him here as a precaution." However, Mostafa Kamal, the BCB president, who visited the hosptial, said Dravid had sustained "light fractures". "I just met Rahul, he is feeling fine and is having his meal," Kamal said. "My doctors have told me that there are couple of light fractures, nothing serious. He will be fine." A very bad news for all of us - Rahul Dravid is injured (possibility of fractured jaw) and has been admitted to ICU in one of the hospitals in Dhaka. He may not be available for the test matches against South Africa. This injury occurred when an attempted bouncer from Shahadat Hussain didn't rise enough and hit Rahul below his ear. He had to retire hurt on the score of 111* (Nelson) when the partnership between him and Sachin was 222 (double Nelson) . Very unfortunate that dravid got this injury. The pitch is terrible. Not very different from the Ferozesah Kotla pitch at which the India-Sri Lanka match was called off a few days back. There is no point in playing this match at the cost of players. With South Africa series coming up, this is a big loss and even bigger risk. i wish Rahul a speedy recovery..praying for him to be back in action soon..
Get Well Soon RahulJi!!! !We are waiting to watch you back on track!!! Wishing Rahul Dravid a speedy recovery. We want him to score more and hit the pacers world over. i request all readers to pray for rahul dravid..
i M SURE DRAVID WIL GET READY SOON...GOD IS WID HIM..
Yeah, it was really unfortunate. The ball didn't bounce as much as Rahul expected. bad luck. But he is a strong wall. i am sure he will recover fast. Best. get well soon Rahul. love u dravid.hope u recover soon.love to see u play again as soon as possible.get well soon.take care. The effect of Rahul Dravid and Laxman`s absence in the team was felt today in Nagpur on the third day of the first test. The team needed somebody to just stand as a rock and oppose any attack. It needed Rahul Dravid - The Wall with a heart of steel and a sea of patience. Showing the full face of the bat with impeccable footwork, the determination to stand against all odds, the grit to wear out anybody against the team and many more, if we keep mentioning them about Rahul Dravid in this situation. Its dreadful imagining and watching the Indian team struggle without him. I wish him good health and peace of mind. If we are fortunate enough, we hope to see THE MAN in the side for the second test against South Africa.